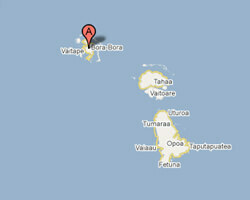 Bora-Bora, the "Pearl of the Pacific", is an extinct volcano posed in a turquoise lagoon. This island in the Society archipelago is located about 255 km in the northwest of Tahiti. Destination loved by couples on honeymoon, Bora Bora is the origin of the concept of bungalows on the water, so romantic. At the seaside there are dream beaches bathed by transparent waters. 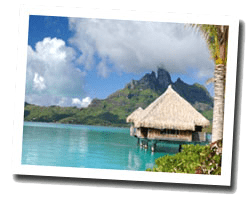 In Bora-Bora enjoy a seaview holiday rental. Vaitape : offering free WiFi, sunsets Hill Lodge provides self-contained apartments on the waterfront or on the hill side. Guests enjoy free use of kayaks, snorkeling equipment, and mountain bikes. All rooms offer picturesque sea views. Motu Tafari : overlooking the magnificent turquoise waters of a private beach, Four Seasons Resort Bora Bora offers luxurious over-water bungalows and beachfront villas with views of Mount Otemanu. open-air fitness centre, spa. Vaitape : Located alongside Matira Beach, Village Temanuata offers traditional Polynesian-style bungalows with a direct beach access. Guests enjoy free snorkelling equipment and there are kayaks available on-site.